Microsoft's vaunted word processor, spreadsheet and presentation apps now use iCloud as a document storage provider. Documents can be opened, edited, and saved directly to and from the service for users on iOS 8. Alongside iCloud support, Microsoft promises unspecified "bug fixes" in the latest versions. The update comes just over three months after Microsoft overhauled the suite to allow users to create and edit documents without an Office365 subscription. Those new versions used Dropbox as a backend storage provider, and also brought the suite to the iPhone. Microsoft brought Office to the iPad last March after years of stop-and-start development. In January, the company added Outlook, based on technology acquired from former top-selling iOS email app Accompli. 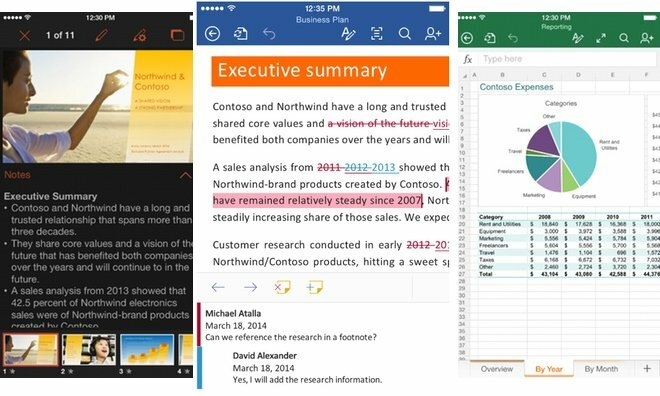 Microsoft Word, Excel, and PowerPoint version 1.6 are now available as free downloads from the App Store.